DHS: Two NY MS-13 Stabbing Suspects Exploited Unaccompanied Minor Loophole to Enter U.S.
Two of the three suspects in the MS-13 gang-related assault of a Long Island teenager exploited the unaccompanied minor loophole after crossing the border illegally in South Texas, a Department of Homeland Security (DHS) official told Breitbart News. The two unaccompanied minors were transported to the New York area where they later allegedly carried out a vicious attack on a group of Huntington High School teens. “Two of the suspects entered into the country illegally through the unaccompanied alien child loophole in the Rio Grande Valley,” a DHS official told Breitbart News on Saturday morning. 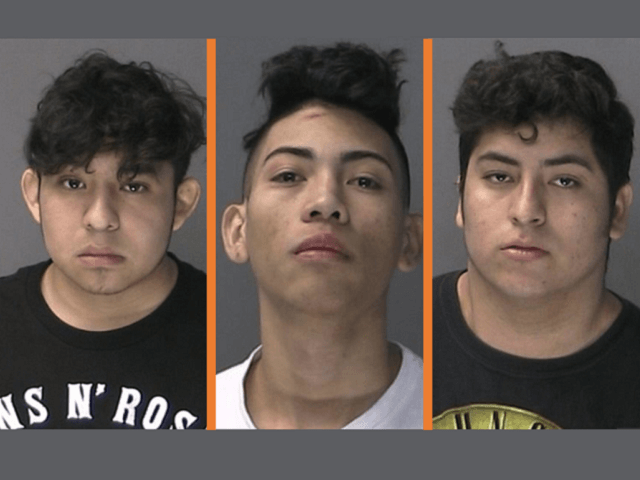 Police identified all three of the MS-13 gang members suspected of carrying out the attack as having entered the U.S. illegally, Breitbart News’ Michelle Moons reported on Friday. Later on Saturday, DHS Spokeswoman Katie Waldman expanded on the reported loophole for unaccompanied minors. Breitbart News reported in April 2017 about the connection between the loopholes allowing virtually unrestricted admission of Unaccompanied Alien Children (UAC) into the U.S.
Texas Governor Greg Abbott and DPS Director Steve McCraw responded to a Breitbart Texas question at that time regarding the connection between the surge of Unaccompanied Alien Children (UAC) from El Salvador since 2014 and the recent spike in MS-13 related crime in Houston and across the nation. McCraw went further, explaining, “MS-13 will press children as young as 13 into the gangs in El Salvador.” He sais a high percentage of the MS-13 gang members are illegal aliens. Later that year, a federal government report confirmed that one-third of MS-13 gang members enter the U.S. as unaccompanied minors. During FY 2017, more than 40,000 UACs were resettled across the country. Fox News quoted immigration experts who said that even if the UACs did not come to the U.S. as members of MS-13, they become targets of the gangs and must join or face the consequences. Fox News cited a case in Islip, New York, where UACs were tied to a violent homicide carried out by MS-13. For the past five (5) fiscal years, MS-13 remained the highest number of gang-affiliated apprehensions by the U.S. Border Patrol. In the Long Island murder case, a group of high school teens visited a Burger King at Huntington Station Wednesday afternoon with a group of gang members were staring at them “in a menacing way,” the Suffolk County, New York, district attorney reported. The gang members allegedly followed the teens out of the Burger King and attacked them with baseball bats and knives. One of the gang members, 19-year-old Ramon Arevalo Lopez, allegedly stabbed a 16-year-old boy in the back during the attack. Officials transported the boy to a local hospital for treatment of non-life-threatening injuries, Fox5 reported. During the first three months of Fiscal Year 2019, more than 19,000 children crossed the border without parents, DHS officials told Breitbart News. It is not clear how many minors in total crossed the border during this period, but in the first two months of the new fiscal year, nearly 60,000 crossed as unaccompanied minors or family units, according to the U.S. Customs and Border Protection’s November Southwest Border Migration Report. “This humanitarian crisis is driven by court rulings and poorly written laws that incentivize the smuggling of illegal immigrants under the age of 18. Funding the border wall, amending the TVPRA, and ending the Flores Settlement Agreement will put smugglers and traffickers out of business and protect vulnerable populations,” DHS Spokeswoman Katie Waldman said in a written statement to Breitbart News earlier this month. “This loophole encourages parents to send their children alone on a dangerous journey to the United States, often at the hands of unscrupulous human traffickers,” officials explained. “Smugglers, traffickers, and their own parents put these minors at risk by embarking on the dangerous and arduous journey north,” she explained. “To those in Congress who continue to refuse to take action to address the loopholes that cause a flood of humanity to travel north and place children at risk, I once again call on you to do your job, protect vulnerable populations, secure our borders, and provide the men and women of DHS the authorities and resources we need to address this crisis,” the secretary said. Editor’s Note: This article has been updated with additional information from the Department of Homeland Security.